Dr. Bleck began his practice in July 2017 at Community Memorial Hospital. Dr. Bleck’s specialty is Family Medicine, also attending obstetric patients, and is surgically trained to perform C-sections if necessary. 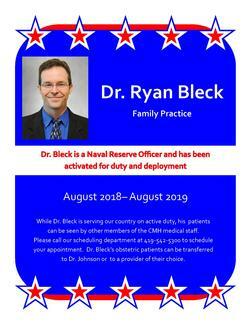 Dr. Bleck will be available for patients again at CMH Family Health Center when his deployment ends in approximately one year. While Dr. Bleck is on active military duty, his patients, can be seen by other CMH providers. Please call 419-542-5300 to schedule with another provider. Dr. Bleck’s OB patients can be transferred to Dr. Johnson or to a provider of their choice.